Would equivalence as it currently exists benefit UK financial services? What are the institutional differences between mutual recognition and equivalence with a third country? Would equivalence with the revisions proposed by the UK in its subsequent White Paper resolve barriers to cross-border trading with the EU? 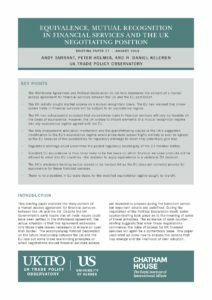 Is there a precedent for the UK’s negotiating position in previous trade agreements? Don’t EU guidelines mean that UK financial services firms can establish themselves abroad, so what’s the issue? The Withdrawal Agreement and Political Declaration do not fully determine the content of a market access agreement for financial services between the UK and the EU post-Brexit. The UK initially sought market access on a mutual recognition basis. The EU has insisted that cross-border trade in financial services will be subject to an equivalence regime. The UK has subsequently accepted that cross-border trade in financial services will only be feasible on the basis of equivalence. However, the UK wishes to import elements of a mutual recognition regime into any equivalence regime agreed with the EU. The fully independent arbitration mechanism and the grandfathering clause in the UK’s suggested modification to the EU’s equivalence regime would prima facie appear highly unlikely to ever be agreed by the EU because of the possibilities for regulatory arbitrage to which they potentially give rise. Regulatory arbitrage could undermine the pooled regulatory sovereignty of the EU member states. Standard EU equivalence is thus most likely to be the basis on which financial services products will be allowed to enter into EU countries –the decision to apply equivalence is a unilateral EU decision. The UK’s wholesale banking sector stands to be hardest hit as the EU does not currently provide for equivalence for these financial services. There is no precedent in EU trade deals for the modified equivalence regime sought by the UK. This briefing paper explores the likely content of a market access agreement for financial services between the UK and the EU. Despite the UK Government’s early hopes that all trade issues could have been settled in the Withdrawal Agreement, the actual situation is that this Agreement addresses only those trade issues necessary to ensure an open Irish Border. The accompanying Political Declaration on the future relationship between the UK and the EU lays out some broad non-binding principles on which negotiations around financial services access are intended to proceed during the transition period, but important details are undefined. During the negotiation of the Political Declaration itself, some counter-briefing took place as to the meaning of some of these principles. The existence of such counter-briefing suggests that when these negotiations commence, the rules of access for UK financial services will again be a contentious issue. This paper uses what we know now to analyse the options that may emerge and the likelihood of their adoption. During the final negotiations of the Political Declaration, the Times published an article on British access to the Single Market for financial services. The newspaper appeared to have been briefed that British negotiators had secured an undertaking for British financial services to obtain uniquely favourable access to the EU Single Market. The thrust of the article was that specific amendments for the UK would be made to the EU’s “equivalence” regime. Such amendments would, in practice, have rendered these EU rules closer to the “mutual recognition’ regime which the UK appears to have proposed earlier in the negotiations and then repackaged in modified form in the Chequers White Paper. That is a regime which would have allowed the UK “to have its cake and eat it” in financial services. The article provoked an immediate Twitter response from the EU’s chief negotiator to say that the EU’s equivalence regime would not be amended for the UK. When the text of the Political Declaration was subsequently published, it provided no evidence of any agreed intent to adjust the EU’s equivalence regime. Nonetheless, an amended equivalence regime appears to be the UK government’s intended starting point in future trade negotiations with the EU since the government’s subsequent paper on the economic consequences of Brexit predicates it’s central estimate for outcomes for financial services on the UK achieving the objectives set out in the White Paper. Consequently, this paper seeks to explain the difference between “equivalence” and ‘mutual recognition” and provides analysis as to why it is highly unlikely that UK-based providers of cross-border financial services will be granted cross-border access to EU markets via any mechanisms drawn from mutual recognition if the UK leaves the EU. In general terms, “equivalence” and “mutual recognition” can both be described as processes by which goods or services produced in a first country (the “home” country) are recognised as being compatible with the standards set in a second (the “host” country). The difference between the two is that mutual recognition is in principle comprehensive: it allows all goods and services meeting the regulatory standards set in the home country to be sold in another without any further assessment beyond those applied in the home country. Equivalence, conversely, requires that the host country assess whether the regulatory standards of the home country meet the regulatory requirements of the host country, with respect to particular sets of home country products, before they are allowed to enter the host market. The application of mutual recognition in financial services within the EU provides for “passporting”, the process by which a service provider authorised in one member state does not require authorisation in another Member State in order to offer services in the latter. The UK government originally appeared to advocate that an EU-UK trade deal on financial services should provide for mutual recognition, whereas the EU stated that the basis for regulatory recognition could only be equivalence. Subsequently, the UK’s position has evolved to accepting equivalence as the basis for agreement but has since sought a bespoke form of “equivalence” that would include significant elements of a mutual recognition regime. The debate about the UK’s approach to Brexit ought to be informed by a realistic appreciation of the likely outcomes for trade in financial services under any future Free Trade Agreement (FTA) with the EU as this trade is economically significant. Oliver Wyman estimates that, in a worst-case scenario, the loss of passporting means that tax revenues would a fall by £8-10bn and 70,000 jobs would also be lost in financial services. Further losses could arise if the UK opted to vary its regulatory regime from the EU one and lost equivalent status where that is available. While financial services are also significant for economic outcomes in other Member States, the costs of Brexit in the sector appear to be heavily asymmetric and weighted against the UK. The leaked UK cross-Whitehall briefing set out that a CETA-type FTA or a WTO deal could see “London’s status as a financial centre severely eroded”. Equivalence is a process by which EU bodies assess whether a third country’s regulatory regime for a particular financial-services product type meets EU standards and, therefore, whether the latter can be permitted to be sold to EU buyers. The equivalence rules do not confer any right for a third country to obtain an assessment nor to receive a positive determination when the third country considers that the relevant criteria are met. The decision is always a unilateral and discretionary act of the EU. Equivalence findings can also be unilaterally withdrawn with as little as 30 days’ notice. Assessment for equivalence is usually initially undertaken by arms-length EU agencies (which are governed by the combined national regulators of the Member States) and the decision, which takes into account that assessment, is taken by the EU Commission. The EU Commission’s decision-making is usually policed by a regulatory committee of Member States’ representatives who must positively approve the decision. While the European Parliament does not have a formal role in the adoption of most equivalence decisions, its observers are invited to the meetings where the decisions are adopted by the regulatory committee. The Commission, of course, can only act within the powers which are delegated to it in the Directives agreed by the Parliament and the Council in the first place. Its actions are also subject to judicial review by the Court of Justice of the European Union (CJEU). This means that the Commission could not grant equivalence to a third country except where the Parliament had already agreed that equivalence should be available for that type of product and subject to an appropriate investigation being conducted. The key points are (i) that the decision to apply or not apply equivalence is a unilateral EU decision – there is no requirement to negotiate with a third country; and (ii) while such a decision is carried out by the European executive function, the latter is constrained by the mandate given to it by the EU political bodies including the Parliament. Within its mandate, the Commission is subject to continued political control from Member State ministries and potential judicial review by the CJEU, which the Parliament can also trigger. From a UK perspective, the product regime which is most problematic in terms of lost revenues is that which applies to wholesale banking. UK based investment banks that currently service corporate clients throughout the EU would no longer be able to do so from the UK. Even where equivalence is potentially available, the status may not be granted rapidly. In the past, equivalence tests have taken 2-4 years to be completed. Mutual recognition within the EU allows goods or services produced subject to the regulatory regime in one Member State to be sold cross-border into any other Member State in principle without having to comply with rules set in the other Member State. In other words, there is collective mutual recognition of the regulatory regimes of the different Member States within the EU. In financial services, once a provider is authorised in one Member State, it obtains a “passport” allowing it to establish itself within another Member State or to simply trade across borders – subject to informing both the home regulator and host regulator, since in practice there is continuing host regulation of some aspects of inbound services, because there can be exceptions to the principle. Host Member States can continue to require home providers to comply with host regulation if they can justify such additional regulation as necessary and proportionate to meet public interest concerns. This ability to impose trade constraints in the public interest is policed by the CJEU which ensures that the constraints are proportionate to the public interest targeted. Where there is continuing national regulatory divergence and if this impedes the development of cross-border trade or creates risks, for example, prudential risks, then the EU will also typically seek Member States’ agreement to adopt EU legislation harmonising regulation across all Member States . Mutual recognition within the EU can, therefore, best be described as conditional rather than absolute. It is unsurprising that since the global financial crisis prudential concerns have limited the degree of regulatory discretion Member States have within the EU. Financial services industries have potentially systematic properties which most other industries do not. The activities of credit institutions are capable of expanding or contracting an entire national economy. If a host country is to allow foreign providers to participate in domestic credit activities, it must have confidence that the foreign service provider is as effectively regulated as possible to mitigate the chances of financial crashes occurring. The host country must also have confidence that when crashes nonetheless occur, the foreign service provider’s home-country regulator would give equal consideration to the needs of the host country’s real economy. UK providers authorised and regulated in the UK should, given the current similarity of UK and EU regulation, be able to access EU markets, and vice versa for EU based providers. In other words, the rights for UK providers would be similar or potentially even superior (see next section discussion ) to “passporting” for product providers within the EU. It would potentially apply to all financial services product types rather than product-type by product-type as under the current EU equivalence regime. The reference to “regulatory outcomes” suggested that this was a system where the rules and practice did not have to be the same as long as similar high-level goals such as good consumer protection and prudential security are pursued. Where the high-level goals were not achieved, there would be a body capable of determining this and enforcing suitable sanctions, proportionate to the degree of breach. This should be supported by institutions which bring together the respective EU and UK regulators in constant dialogue. One of the critical rules in any decision-making system is the default that applies when no decision can be made. If the parties to an agreement do not truly share the same objectives, then one of the parties may seek an institutional design that permits stalemate and so reversion to a default which favours it. When a failure to agree on regulatory approaches occurs, equivalence and mutual recognition potentially give rise to very different defaults. Under equivalence, when the parties cannot agree on regulatory approaches, the default is no trading. Under the original UK model for mutual recognition, the default is access and that withdrawal of access should only be permitted after the parties have gone through a dispute resolution mechanism. This is the reverse of how mutual recognition generally works within the EU, where barriers can be imposed by Member States and then their proportionality can be tested in the courts. In the UK proposal, the evidentiary burden for justifying the imposition of any barrier looks as if it could have been particularly high; partly because of the nature of the test and partly because of the nature of the institution which might have been constructed to assess the validity of any barrier. The default matters to parties if there is concern that they do not share the same objectives or that these may diverge over time. While the UK currently insists that it wants high levels of regulation for financial services, there is a great deal of evidence that this is not an undisputed view in British political circles. Typically, EU rules prescribe at least a minimum coverage/level of regulation, so a default that permitted UK divergence from EU rules in the event of stalemate would differ from the status quo ante because it could allow UK divergence away from EU minimum standards. Establishing equivalence (or its absence) requires a three-pronged assessment: of the black letter legal requirements; of the effectiveness of supervision for compliance and enforcement by domestic authorities as assessed by the relevant EU body; and, of whether the combination achieves the same outcomes as EU rules. Ongoing reviews are also an explicit feature of more recent equivalence provisions in Directives. Nonetheless, it is primarily an ex ante review of the operational rules. Assessing the “high-level regulatory outcomes” referred to in Mrs May’s proposed mutual recognition system would have been much harder. It would potentially have been an ex post review of what had happened. The UK had sought an ab initio declaration of equivalence, given the starting point of identical regulation. The UK might then have undertaken future changes to UK rules to which UK providers would have been able to react commercially straight away. If it were concerned by the UK rule change, the EU would then have had to seek arbitration where the panel would have needed to establish whether “high-level regulatory outcomes” had been or were likely to be prejudiced. Such a process would require ex ante agreement on what outcomes constituted success and failure (or an even more long-winded process where such norms were to be established by the dispute body itself in the context of a decision) and then the acceptable levels of tolerance for deviation. There would also need to be an agreement as to which outcomes should be prioritised when there were potential tensions (e.g deeper capital pools for borrowers in the short-run versus greater risks of capital inadequacy on the part of lending institutions and therefore greater macroprudential risks in the long run). It would require rules around establishing causation and counterfactuals. There is no evidence that the UK sought to define such criteria up front. The test for the dispute body to have tackled a breach also appears to have been described as backward-looking over a long time period: “regulatory outcomes over time”. This would have required an agreement on the relevant time frames over which an “outcome” ought to be assessed. It might also have meant that it would not have been possible to rescind mutual recognition where a country weakened its prudential rules until after market failure had occurred. This is not likely to have been very attractive to the EU with respect to products produced by credit institutions which are capable of having systematic effects on national economies. The sheer complexity of the tests required for the purposes of withdrawing mutual recognition might at a minimum have made its decision-making very long-winded. It might potentially also have made the dispute body prone to stalemate and thereby favoured the default outcome. Under equivalence, the ultimate decision-making bodies within the EU are effectively the democratic institutions of the EU. They set the parameters of EU financial services legislation and the EU agencies and Commission can only assess equivalence in line with those parameters. Under UK-style mutual recognition, once set up under a Free Trade Agreement, the dispute body might in practice have become the ultimate arbiter of financial service regulation in the EU (and the UK). While the dispute body would have been unable to overrule domestic regulation directly, it would have created indirect pressure to do so by creating the opportunity for regulatory bypass and by the threat of trade sanctions if the EU had sought to frustrate the bypass. Regulatory bypass would have occurred if, for example, banks opposed to an EU regulatory rule regarding bonuses or a financial transaction tax relocated to the UK where such a rule had not been adopted. If the dispute body assessing mutual recognition had been a separate judicial one, it would be particularly independent because it would, as discussed above, probably be impossible to specify “regulatory outcomes over time” except in the most general terms, which would in turn have given the body very wide interpretative discretion. A concern often expressed is that constitutional courts will interpret the “incomplete contracts” in constitutional rules on the basis of too narrow a set of concerns. This could be the case with a trade dispute body set up under a specific trade deal and focused on financial services; it would likely have had a mono-focus on financial services market access rather than have the wider set of balancing socio-economic considerations which the CJEU has to take into account when it makes decisions. It is, for example, possible to imagine that a trade dispute body might weigh the balance between regulatory discretion to limit macro-prudential risk and barriers to market access differently from a general court. The CJEU would have to take into account principles of the Treaty such as preserving the social market economy and obtaining high levels of employment when assessing proportionality of regulatory decisions, whereas a trade arbitration body would not. The same concern about too narrow a focus would not be as true for a political body since the respective representatives would be operating under delegated authority from national political institutions. However, the rules around decision-making in a political body might be particularly prone to stalemate and thereby lead to the default outcome. This could generate commercial winners and losers where some benefited from the absence of a level regulatory playing field and others did not. The EU might have both legal and political difficulties in agreeing to mutual recognition with the UK. The proposed UK form of mutual recognition would potentially have provided the UK with greater decision-making scope than would be available even to EU Member States. It would potentially have allowed it an ability to ignore any of the additional standards imposed individually or collectively by other Member States if they exceeded the UK’s preferences. It would have been unprecedented for the EU to agree this for a third country. Furthermore, in so far as the EU was forced to revise its standards in the future as a consequence of any bypass pressures unleashed by the Free Trade agreement, the UK would have had a greater ability to set the terms of mutual recognition in practice within the EU than any one other individual Member State. Based on precedent, the issue as to the legality of the proposed EU-UK mutual recognition process from an EU law perspective would hinge around whether it gave an external court the ability to rule on matters of internal EU law. The original UK proposal could, in principle, have been designed not to offend CJEU precedent. The Government’s initial position appears to have taken into consideration a paper by the International Regulatory Strategy Group. This paper is at pains to say that the dispute body would only have been able to rule on compliance with the agreement and to set countervailing sanctions such as trade restrictions, where there is a breach. It would not have been able to strike down EU law. In opinion 1/91 on the original EEA agreement, the CJEU advised against the original inception of the EEA Court because it would have been able to produce legal decisions which impacted on the autonomy of the Court. This would not be the case here and in the EEA opinion, the CJEU did recognise that the EU could strike international trade agreements with their own judicial organs provided the latter were restricted to ruling on compliance with the trade agreement alone. However, the CJEU is not bound by precedent. It is required to interpret the Treaties which make up the economic constitution of the EU to ensure that certain outcomes are achieved. The indirect effect of the actions of the dispute body could, in theory, have potentially impacted on the objectives aimed for in the Treaty. The IRSG report itself states that determinations could give clarity on whether either party would need to change its regulatory system in order to remain compliant with the terms of the EU/UK agreement. This does not, of course, make it any different from any other agreed trade deal. However, the strategic significance of the sector for the UK might have made trade litigation or the threat of litigation a greater indirect pressure on the EU than that created by other trade deals. The CJEU could have seen this dispute body as a threat to its interpretative authority and to the coherence of the EU legal order and, therefore, there might have been incentives for the Court to innovate legally and block the introduction of this model. It is noticeable that the Withdrawal Agreement avoids such concerns by giving the CJEU the exclusive right to determine any legal issues which arise before the arbitration panel created for the purposes of that agreement. The UK’s White Paper on the Future Relationship with the EU, states that the EU’s existing equivalence regime does not meet the UK’s needs as, inter alia, the UK requires a wider set of products to be covered, that withdrawal of equivalence should be subject to fully independent arbitration, and that UK firms’ existing cross-border activity should be protected by a grandfathering provision even if the UK regime in a particular product area loses a designation of equivalence. It is explicitly assumed that these objectives will be achieved for the purposes of modelling the central estimate in the Government’s long-term economic analysis of Brexit. They are described as forming part of the “close and structured cooperation” referred to in the Political Declaration. The second and third of these elements would reduce the EU’s regulatory autonomy and set up potential conditions for regulatory bypass. For the reasons discussed above, in relation to the UK’s proposed mutual recognition regime, the fully independent arbitration mechanism and the grandfathering clause would prima facie appear highly unlikely to ever be agreed by the EU. It is also worth noting that such measures would involve not only a loss of collective sovereignty on the part of Member States but also potentially for the European Parliament. This could increase the difficulty of getting any such measures ever agreed, even in the unlikely event the Commission and all Member States and their parliaments agreed it. An extension of the set of products covered by equivalence in any UK FTA might be more feasible, although the EU might also have to offer it to other countries like Canada and South Korea by virtue of most favoured nation clauses in those agreements, potentially raising the “price” it would demand of the UK. There appears to have been a misconception held by many UK journalists and politicians that because recent Free Trade Agreements agreed by the EU contain financial services chapters, they must entirely liberalise free trade in these services. This may have arisen because these agreements are generally described as “comprehensive”. Unfortunately, the latter description is only relative and arises from the low base-line against which the deals are judged on the services front. In practice, the content of the financial services chapters is severely limited by exceptions. Magntorn and Winters provide a very helpful breakdown of the EU-Canada deal which sets out the extent to which financial services liberalisation is limited. Thus, even if a post-Brexit EU-UK FTA were to include provisions on financial services equivalent to those found in recent EU Free Trade agreements, this would entail a serious reduction in the freedom of trade in services compared to the current position. In the UK, there have been specific suggestions that by refusing to contemplate the UK proposals, the EU is not treating the UK in the same way that it was prepared to treat Canada and the US. This is not, however, accurate: there is no precedent for mutual recognition of this type for financial services in any trade deal. The Council guidelines do have this implication. This would mean that the profits could be repatriated back to the UK, in so far as the banks’ owners are UK-based (though many will be owned by shareholders around the world and in particular in the United States). However, taxes on the activity of the firm would flow to the host state. Salaries of employees would be earnt, spent and taxed in the host state. It is the loss of these economic flows which should be of grave concern to the UK. The section in the Political Declaration relating to financial services appears to put the emphasis on the parties’ regulatory autonomy in operating separate equivalence regimes but the wording may potentially be subject to different interpretations. We have set out how the UK’s original approach could have permitted regulatory bypass. These potential bypass possibilities have been maintained in the White Paper proposals. The effect of such a bypass would potentially be to take “control” away from the EU as to how financial services are regulated within EU boundaries. The rules and institutions that the UK appears to be suggesting might (deliberately) make correcting any excessive weakening of regulation (from an EU perspective) very difficult or impossible. It is very hard to see how a UK desire for unilateral sovereignty, rather than pooled sovereignty, in financial services could be squared with a desire to continue selling largely unrestricted financial services exports into a larger trading bloc that wants to preserve its pooled regulatory sovereignty. Privileged access is particularly unlikely to be granted when there has been substantial argument by UK elites to the effect that the benefits of leaving the EU reside in deregulating the UK financial services industry. European Parliament Research Service, “Understanding Equivalence and the Single Passport in Financial Services”, p.3. Oliver Wyman (2016) “Brexit Impact on the UK-based financial sector”. Some equivalence decisions require delegated legislation which does require approval from the Parliament as well as the Council of Ministers. The Monetary Affairs Committee of the European Parliament is currently calling for all equivalence decisions to be delegated acts so that the Parliament will always have a say. The table simplifies the equivalency requirements. The product types actually require almost 40 different tests applying to various subsidiary activities. See the report cited in footnote 10 for an estimate of the economic losses. Open Europe, op. cit. p.34. The Times, 6 March 2018. Ferran provides the example of the Icelandic authorities deciding to protect domestic depositors but not foreign ones, in Kern et al “Brexit and Financial Services”, p.3. For a discussion of how equivalence is applied, see the House of Lords European Union Committee, “Brexit: the future of financial services regulation and supervision”, 27 January 2018, para 126 and on. Stone-Sweet, A(2000) Governing with Judges. Constitutional Politics in Europe. See for example with respect to public procurement decisions where the ECJ balances market access considerations with social and environmental objectives, Sjafjell, B and Wiesbrock, A. (2016) Sustainable Public Procurement under EU Law, p.12. Ferran, E (2018) notes that there are different “animating philosophies” between international trade regulation and international financial regulation in the chapter on “Regulatory Parity in Post-Brexit UK_EU Financial Regulation” in “Brexit and Financial Services”. https://www.irsg.co.uk/resources-and-commentary/a-new-basis-for-access-to-eu-uk-financial-services-post-brexit/ . We note that the IRSG paper covers a range of mechanisms for achieving market access and not just the mutual recognition approach. ECJ, OPINION 1/91 OF 14. 12. 1991, para 40. In the recent Achmea case the CJEU ruled against intra-EU Investor State Dispute Settlement (“ISDS”) tribunals. Some commentators think the language of principle in the decision means that the CJEU may rule against ISDS courts in a pending case regarding the ISDS provision in the EU-Korea agreement. http://eulawanalysis.blogspot.co.uk/2018/03/the-cjeu-ruling-in-achmea-death.html. This Court may also have been sending a signal to the Commission and the Council as regards the content of any deal contemplated with the UK. CETA stands for Comprehensive Economic Trade Agreement. This is recognised by the IRSG. https://www.irsg.co.uk/resources-and-commentary/a-new-basis-for-access-to-eu-uk-financial-services-post-brexit ,p. 5. The House of Lords report also notes “Although the Government is well aware that there is no precedent among existing free trade agreements for such an ambitious mutual recognition regime, covering both financial and non-financial services, there is not a general understanding of this point.” Op. cit., footnote 12, para 142.